Do you ever wonder if it’s possible to manage iPhone contacts on PC? Sometimes it’s much easier to just use your computer than to shuffle and tap through all of the phone numbers on your iPhone manually. Let’s say, for instance, that you need to delete duplicate contacts, or just some specific contacts. That can take a long time if you try to do it manually on iPhone, and it’s much easier to do it on your PC. The best way to manage iPhone contacts on PC is by using an iTunes alternative like iMyFone TunesMate. This is an all-in-one iPhone manager that will give you the most control of your iPhone/iPad/iPod. It gives you the choice to manage iPhone contacts on PC. Export contacts to PC in vCard, CSV, Outlook, Windows Address Book, etc. Import contacts to iPhone from vCard, CSV, Outlook, Windows Address Book. Merge iPhone contacts or delete duplicates. Ditectly create new contacts or edit the existing contacts. Here we take getting rid of duplicat contacts for example to show you how to manage iPhone contacts on PC. Download TunesMate and install it on your PC. Connect your device via USB. On the left-side menu you will see a list of different types of data. Click “Contacts”. Click “De-duplicate,” choose the match type, then merge your contacts. After going through these simple steps, you should be rid of your duplicate contacts. TunesMate comes with many other features as well. It allows you to transfer many different kinds of data easily, without the need for iTunes or any of the native software that Apple provides. Instead, you have a lot of freedom and functionality that you otherwise wouldn’t. The ability to import your contacts to your computer (both PC and Mac) from your iPhone. The ability to import contacts that you have saved on your computer to your iPhone. You can restore backups that you saved on your computer, so you have one less thing to worry about if your iPhone is ever lost. You can also pick and choose what contacts you want to restore to the iPhone. The ability to transfer your contacts from one iPhone to another. This is especially valuable if you find that you want to transfer your contacts from your old iPhone to a new one, but you don’t want to transfer all of your other data. Using iTunes, you can only backup your entire iPhone and transfer the backup, but with TunesMate, you have the freedom to selectively transfer whatever data you want, including individual contacts. As you can see, iMyFone TunesMate is miles ahead of iTunes and can save you a lot of trouble and headaches. With TunesMate, you can select and edit individual contacts to save on your computer. You can’t do this manually with iTunes. With TunesMate, you can mass delete duplicates with just a few clicks. You can’t do this manually on your iPhone, or with iTunes. Similarly, with the iMyFone application, you can transfer iPhone contacts to another iPhone easily, in just a few steps. You can also choose which ones to transfer. 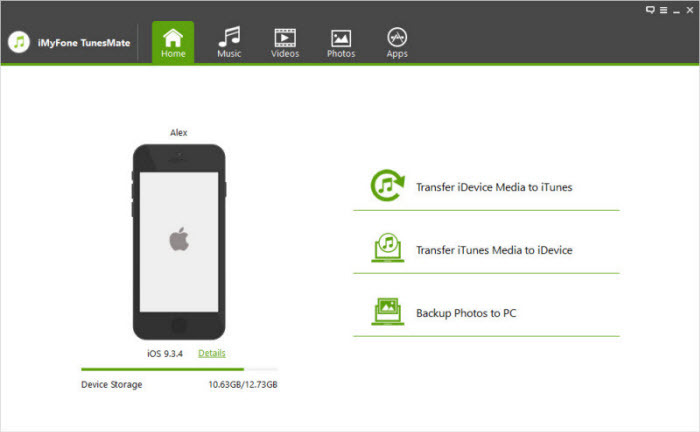 Manually, you can only transfer contacts from one iPhone to another by backing up the data and restoring. You can’t select and transfer individual contacts at all. So if you need to manage/edit iPhone contacts on PC, iMyFone TunesMate is a great tool to have.